The RP Photonics Buyer's Guide contains 22 suppliers for Faraday rotators. where V is the Verdet constant of the material, B is the magnetic flux density (in the direction of propagation), and L is the length of the rotator medium. Note that the Verdet “constant” usually exhibits a substantial wavelength dependence: it is smaller for longer wavelengths. An important aspect is that the change of polarization direction is defined only by the magnetic field direction and the sign of the Verdet constant. If some linearly polarized beam is sent through a Faraday rotator and back again after reflection at a mirror, the polarization changes of the two passes add up, rather than canceling each other. This non-reciprocal behavior distinguishes Faraday rotators e.g. from arrangements of waveplates and polarizers. Concerning the physical origin of the polarization rotation, one may consider a linearly polarized beam as a superposition of two circularly polarized beams. The magnetic field causes a difference in phase velocity between these circularly polarized components. The resulting relative phase shift corresponds to a change in the linear polarization direction. The field strength should be as high as possible, such that a certain rotation angle (e.g. 45°) can be achieved with a short rotator medium. This reduces detrimental effects related to parasitic absorption (and the resulting thermal effects) and to nonlinearities of the medium. The magnetic flux density should be as uniform as possible over the region where light is sent through the medium. In that way, a spatially uniform rotation angle is achieved. These goals involve certain design trade-offs. In particular, a larger geometric cross section with good field homogeneity tends to require stronger magnets or to reduce the achievable field strength. For such reasons, devices are optimized for different purposes. There are heavy and expensive high-power devices with a large aperture as well as much cheaper miniature devices for low power levels. 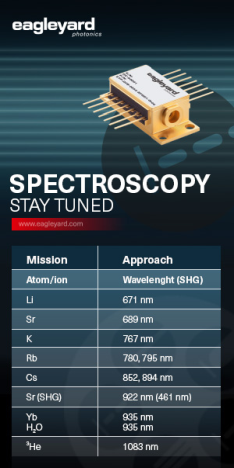 Apart from a high Verdet constant, the Faraday medium should exhibit a high transparency in the spectral region of interest, a high optical quality, and sometimes also a high optical damage threshold. Often used Faraday media for the near-infrared spectral region are terbium–gallium garnet crystals (TGG) and terbium-doped borosilicate glass, which exhibit relatively large Verdet constants. A common choice for telecom components operating in the 1.3-μm or 1.5-μm spectral region is yttrium iron garnet (YIG). For operation with high optical average powers, parasitic absorption in a Faraday rotator can lead to substantial internal heating and consequently to thermal beam distortions. In particular, thermal lensing can occur. Both the power-dependence and the significant aberrations of the thermal lens can be very disturbing. Additional aspects of high-power operation are discussed in the article on Faraday isolators. In most cases, reflection losses on the input and output surface of a Faraday rotator are minimized with anti-reflection coatings, designed for the intended range of operation wavelengths. Note that the operation bandwidth can be limited not only by the coatings, but also by the wavelength dependence of the Verdet constant. A particularly important application is in Faraday isolators, as needed e.g. to protect lasers and amplifiers against back-reflected light. For that application, the rotation angle should be close to 45° in the spectral region of interest. A highly uniform polarization rotation is desirable for obtaining a large attenuation for back-reflected light. A Faraday rotator in a ring laser resonator can be used to introduce round-trip losses which depend on the direction and thus enforce unidirectional operation. As only a very small loss difference is often sufficient, a Faraday rotator providing only a very small rotation angle may be sufficient. An additional half-waveplate may be used to compensate the polarization rotation for one beam direction. Figure 1: Setup of a double-pass laser amplifier. The Faraday mirror on the right side ensures that the polarization state of light is not distorted after a double pass through the amplifier medium. A 45° rotator combined with an end mirror forms a Faraday mirror. If a laser beam is sent through some amplifier (see Figure 1), then reflected at such a Faraday mirror and sent back through the amplifier, the returning beam has a polarization direction which is orthogonal to that of the input beam – even if the polarization state is not preserved within the amplifier. Therefore, a polarizer can reliably separate the counterpropagating beams. This works better than using a Faraday isolator (with an output port for reflected light), an amplifier and an ordinary mirror. The latter technique can also be utilized in similar form within laser resonators of certain high-power lasers for minimizing the polarization distortions and thus depolarization loss. Fiber-coupled Faraday mirrors are useful e.g. in fiber-optic interferometers and certain fiber lasers. A variant of isolators are Faraday circulators, having three optical ports.